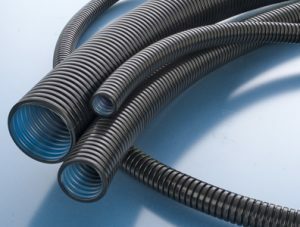 Very good ductility and good reversed bending charact. 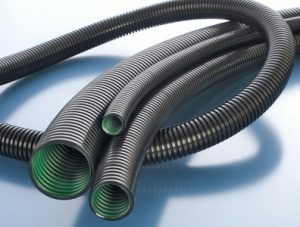 Multilayer conduit with green inner layer for static and lightly dynamic roof and undercarriage installations. 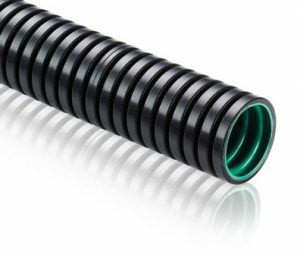 The combination of a green PA 6 inner layer and black PA12 outer layer provides a very good balance of characteristics with an optimized price-performance ratio. 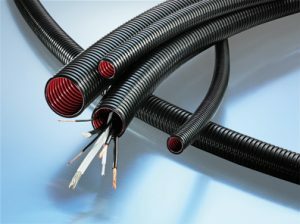 Multilayer conduit with orange inner layer for highly dynamic external installations in railway vehicles. The highly flexible XPCSF conduit with an orange inner layer is the optimal product for external applications. The combination of two different layers offers the highest level of fire safety with EN 45545-2 HL3, excellent dynamic characterisics, weathering resistance and very good ageing characteristics. 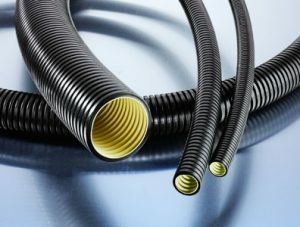 Three layer corrugated conduit, very flexible, medium-duty (Multilayer).